Built around the Pearl River (China’s third longest), exploring Guangzhou by boat is a great way to see the city. A night tour of the Pearl River is a popular choice, when the bright lights of the city skyline reflect on the water creating a magical view. Get a feel for this chaotic city on dry land at Shangxiajiu Pedestrian Street in the Liwan District. One of the busiest commercial streets in China, it’s a showcase for local cuisine and customs, as well as Cantonese and European architecture. Those looking for more spiritual sights will not be disappointed. At the heart of the busy old town on the north bank of the river is the Sacred Heart Cathedral, a neo-gothic Roman Catholic place of worship that’s the largest of its kind in Southern China. Commissioned by the French clergy it was built between 1863 and 1888 by Chinese workers who’d never even seen another European cathedral. Dating back 1,700 years and said to be older than the city itself, is The Bright Filial Piety Temple, Guangzhou’s oldest Buddhist temple. Holding an important place in Buddhist history, its relics allow visitors to gain an understanding of the history of Chinese Buddhism and culture. Other temples of note include the Temple of Six Banyan Trees, built in AD 537 to enshrine Buddhist relics brought over from India and a teaching place of many prominent monks, including the founder of Zen Buddhism, and The Ancestral Temple of the Chen Family, which consists of 19 buildings joined by corridors and epitomises traditional Chinese architectural style. Experience some European styled architecture on Shamian Island in the Liwan District. An important port from the time of the Song and Qing Dynasties, where you’ll find buildings in gothic, baroque and neoclassical styles amid a gentle stretch of gardens. Arguably Guangzhou’s most scenic spot is Baiyun Mountain (White Cloud Mountain). A place of exquisite natural beauty, boasting lots of interesting historical relics. Reach its summit and you can enjoy unparalleled views of the city and the Pearl River. 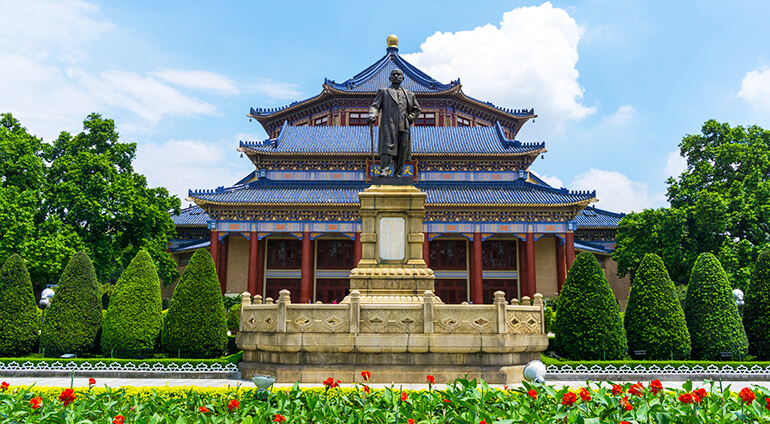 Yuexiu Park, the city’s largest, is another great place to take a break from the busy streets. Here a pretty ecological landscape is dotted with cultural relics, including its famous statue of Five Rams, the symbol of Guangzhou and supposedly carried the five immortals who founded the city. Showcasing Guangzhou's near 2,000-year history and the elegant architecture of the Han Dynasty (206 B.C.-24 A.D.) is The Nanyue King's Tomb Museum. Hidden more than 65 feet underground (20 metres) it was only discovered in 1983 and houses the incredible burial site of second king of Nányuè, Zhao Mo, made from precious Jade. Those looking to take home some relics of their own should head to Xiguan Antique Street, which sells everything from Tibetan rugs to old ceramic vases, although many of the “artefacts” here are fake.